This bonsai i create my self where the small tree i cut from the branch of big tree and plant it in the sand. After that i bought the stone and put the small tree on the hole in the stone. But still need another years to make this tree perfect. 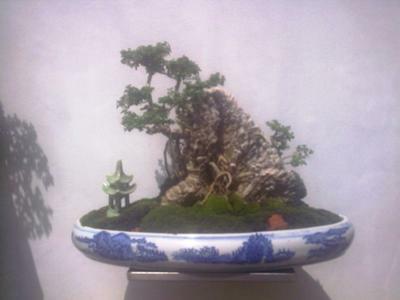 very nice penjing.I like it.what,s the species of the tree?. Very brilliant. Keep it up.